MARBLE FALLS — A piece of fashion history from one of the most prestigious and influential design houses in the world will be in Marble Falls on May 25 to help launch Stella Ella Vintage Dress Shop and Boutique. 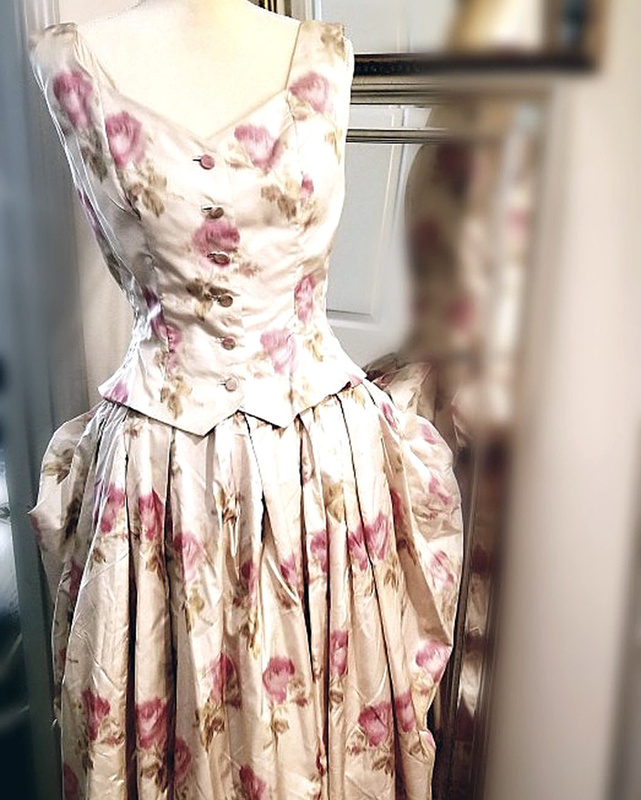 Kim Chandler, owner of Stella Ella, obtained a 1955 vintage Christian Dior dress, which will be on display during an open house from 10 a.m.-7 p.m. Friday, May 25, at the new boutique, 1800 Mormon Mill Road, Suite A2. She acquired the dress from a private seller and conducted her own research into the French fashion icon who designed it. Chandler noted that the Dior dress she has was made two years before the designer died of a heart attack in 1957, making it one of the last couture items he created. Haute couture refers to high-end, handmade fashion using expensive materials and painstaking attention to detail. Dior, who born in 1905 in Granville, France, had a humble start to his fashion career, first selling sketches outside his home for 10 cents each. In 1928, after receiving money from his father, Maurice Dior, to finance a small art house, Christian and a friend sold art made by the likes of Pablo Picasso, Jean Cocteau, and other notable names. Fashion designer Robert Piguet hired Dior in 1937 to design three Piguet collections. That’s when Dior learned “the virtues of simplicity through which true elegance must come.” By 1946, Dior, who had spent the last four years as one of two primary designers for Lucien Lelong, was ready to start his own fashion label. In 1947, Dior presented his first fashion line, which revolutionized the way women dressed: shoulders were brought in and sloped at the top; the waist was nipped and tight; and full skirts were dropped to the ankles. In the 1950s, Dior’s pieces were worn by famous actresses Ava Gardner, Grace Kelly, and Marlena Dietrich as well as members of several royal families. The reason, according to fashion experts: Dior accentuated femininity. Though Dior only designed fashions for 10 years, his work and ideas still influence the industry and art. Today, when women step out for formal events, a night at the theater, or another high-end social engagement, they still prefer dresses that feature many of Dior’s timeless elements. Attached to Chandler’s dress is a label from France with a serial number as well as a Blum’s Vogue-Chicago label. Blum’s was a specialty department store founded in 1910 by Becky and Harry Blum in Chicago’s Congress Hotel. The hotel became home to actresses Sarah Bernhardt, Ethel Barrymore, and other theatrical stars of the day. The Blums later opened Vogue while still operating Blum’s. Blum’s sold ready-to-wear clothing, while Vogue sold custom-made clothing. In 1924, the Blums purchased their own building and combined the two stores into one to create Blum’s Vogue, which became enormously successful. That success compelled the Blums to open several locations nationwide. “Celebrities and people of wealth would go shop there,” Chandler said. Chandler hired a curator to find out more about the 1955 dress such as other owners and its history. The boutique owner has two options after the dress has made its Marble Falls debut: She can send it back to the House of Dior in Paris or to an auction house in New York. “Fashion students may want to see it before I ship it,” she said. Chandler said Stella Ella is on the hunt for more dresses and gowns. Contact her at (424) 215-8978 for more information. Fashion as art! What a wonderful addition to our community.